These products are handmade from Kentish hazel trees, which are hand harvested on a coppice cycle. Coppiced hazel is very fast growing and is a strong and light wood as well as being a renewable resource that promotes woodland wildlife. 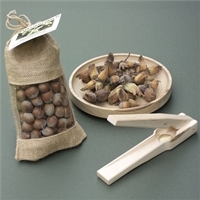 The nut crackers have been designed to fit comfortably in the hand and efficiently crack a nut without shattering shell everywhere. 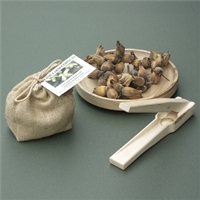 The nut bowl is hand turned from English sweet chestnut and will comfortably hold a bag of cobnuts.